A brand exists in time because we exist in time. It has a past, a present and a future. Okay, a completely new brand has no past. But all other brands have a past, a history. They have a backstory. As consumers we don’t forget out past experiences with a brand. Or what we heard about the brand from friends, movies and, yes, advertising. For example, I never owned a VW bug. Even so, I have many strong memories and associations with the brand. My impressions range from the hazy recollections of seeing cars on the street to a vivid memory of going with my daughter to see the Lindsey Lohan movie “Herbie Fully Loaded”. Therefore the brand story needs to have a past, a present and a future: yesterday, today and tomorrow. The art of creating a compelling brand story is to talk about about today, but weave in the strongest elements of the past. Then it needs to have a forward leaning element so that we want to know what tomorrow will bring, we want to turn the next page. There is always another chapter to be written in the story of a brand. 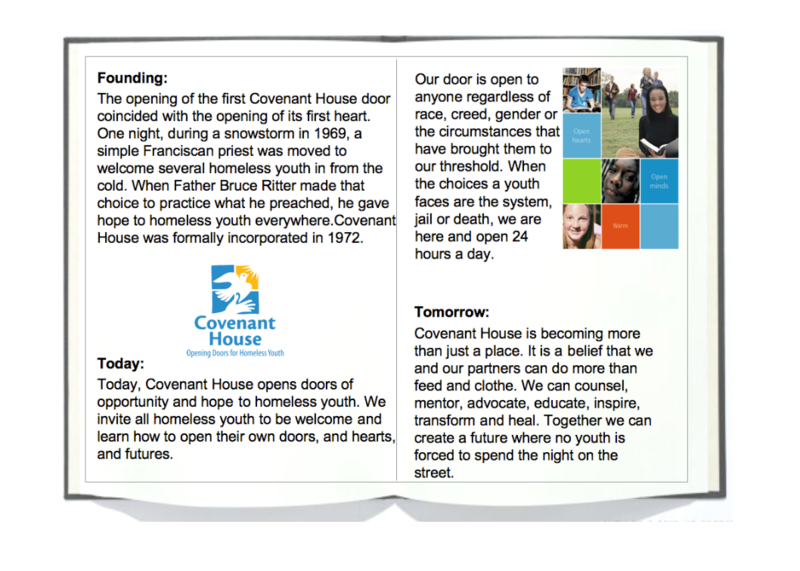 We use this framework of a past, present and future to update the Covenant House brand story. We use language that is vivid, alive, evocative. The story matters because the stakes are so high. This story has the power to save the life of a teenager. The brand story does not stop here. It goes layers deeper. Within the Covenant House brand story are all of the life stories of all the individuals who have ever been touched by the organization. Each story will break your heart. The next post is on renewing the covenant through renewing the visual identity. In the meantime, consider making a donation to Covenant House this year. It can save a life. Through interviews and workshops we recognize a gap between how at-risk teens view Covenant House from the outside and how they experience it once they are across the threshold and actually inside. From the outside they view Covenant House as cold, institutional. Inside they find themselves in a warm, open community that treats them with respect and gives them the tools to make the transition into productive and healthy adulthood. The branding is part of the problem. Research shows that homeless kids see a bird in a cage or trapped in house. The bird is still, perched on the hand. The color is a cold institutional blue, and often only a black and white version is used making it seem even more institutional. There is nothing about the branding that signifies this is for homeless youth. They are reluctant to walk into a building with that logo. To confuse matters more, the logo is different in many cities, prominently displaying the city name or different messages locked up. It is hard to recognize them all as part of a single organization with a uniting purpose and mission. The re-branding needs to make it easier for teens to walk through that door. Covenant House can only fulfill their mission of helping homeless young adults by raising the funds to support the organization. It is not supported by the government and it is not supported by any organized church or religious group, even though it was founded by a priest. It is supported almost entirely by donations from individuals across the US and Canada. As you will recall from the last post, Covenant House has avoided much publicity after the founder, Father Ritter, resigned in the early 1990s. By 2006 this has an unintended longer term effect — a whole new generation of potential donors has grown up unaware of Covenant House. And those who are aware of Covenant House tend to know very little about it. The confusion of different logos and different messages for different cities is not making it any easier for potential donors to know about Covenant House. There is little about the name to connect it to the core mission. And there is little about the logo that is immediately symbolic of homeless youth. Now, in 2006, the rebranding program has two major challenges. 1. Building stronger connections with homeless youth. 2. Building new connections with a new generation of donors. In all of the investigation, the interviews, the research, a strong central metaphor keeps being raised. Whether it is about having an open door policy, or getting teens to cross through the doorway or opening doors of opportunity. The “open door” metaphor has a profound connection with the mission of the organization. So we use that as the central metaphor in creating a new brand story for Covenant House. This tagline that we create summarizes the metaphor and explicitly brings in the missing message that this is for homeless youth. It is more than a tagline, however. It is the beginning of a new vocabulary at Covenant House that talks in a more relevant and meaningful way with teens. An open door is welcoming. It replaces the “24/7 open intake” language of a social worker. From this core metaphor we write the next chapter in the Covenant House story. In the next post I will go into the structure of the story and the challenge of changing the narrative arc so that the best part of the past contributes to a stronger future. In the meantime, consider making a contribution to Covenant House today. This is the time of year when many people are making additional donations to good causes. I’d like to suggest one to you: Covenant House. Each year they are opening doors of hope and opportunity to homeless teenagers and young adults. It’s for kids who need to get off the streets and into a safe environment where they can heal and gain strength for the future. Covenant House is always open for them. My involvement with Covenant House began in the fall of 2006, when we were invited to speak to them about their branding needs. I had an immediate connection with them. Perhaps it was because I come from New York City where Covenant House began and has a long history. It may also be because I personally knew a family in trouble. Either way, their story struck me viscerally. In this post and the next few I will go into the rebranding case of Covenant House because it is a good example of how to use Narrative Branding in practice. This is the story of how the metaphor of an open door has opened a path of hope for the homeless teens. The Setting: It is 2006 and Covenant House has come to recognize that their branding has begun to lose relevance among teenagers and among potential new donors. We are invited in by Kathleen Fineout, head of communications, to speak about how branding, story telling, can help Covenant House create a stronger connection with homeless teens. We start the process by asking them to share their stories, their personal stories about Covenant House and their involvement with the organization. An interesting pattern about the history of Covenant House is revealed to us. The organization was founded by Father Bruce Ritter in the 1960s. He was living in New York City’s lower east side at the time, a marginal neighborhood, when a tremendous snowstorm struck the city. Outside of his window he could see a couple of teenagers huddled together in the doorway across the street. He went out in the storm, reached out to these homeless kids and brought them into the warmth and shelter of his apartment. From that came the inspiration for Covenant House. In our interviews some speak of being drawn in by the charisma and vision of Father Ritter. Others caution against the past. Father Ritter, and Covenant House by association, was caught up in tabloid accusations in the early 1990s. While the accusations were investigated and generally dismissed, Father Ritter resigned and the damage to the organization’s reputation had been done. It is this past that many want to keep in the past. As a result, Covenant House has generally stayed out of the public eye. During this time the organization has quietly rebuilt and strengthen, now reaching 20 cities in 6 countries. Larger and helping more homeless youth than ever before but mostly out of site of the general public. Which brings us to today. By keeping a low profile, Covenant House is known by fewer and fewer prospective donors each year. At the same time, those who remember the scandal have not heard a new story that will change the thread of the narrative and make them feel more positively about the organization. The secret of the past is getting in way of the good work of the present. It is 2006. The organization is led by Sister Patricia Cruise who knows it is time to face the challenges. Time to reconnect with homeless youth. Time to reach a new generation of donors. Time to renew the Covenant. Tomorrow’s post on how we developed the next chapter in the Covenant House narrative and insights into branding challenges of renewing a reputation. Recently I came across data showing the decline of broadcast viewership vs. the growth of cable viewership. The chart clearly showed that the good old days of 3 major networks is over. Companies are adopting completely different media strategies, not only moving to cable but also to digital media. The creative vehicle was thirty seconds long. Sometimes there were executions as long as 60 seconds at the beginning of a campaign. The message of a brand had to be distilled. A whole new marketing science grew up around that distillation. The branding model that dominated was brand positioning. The age of brand positioning was declared the age where brand strategy was more important than creative brilliance. In fact, Trout and Reis declared that the age of creativity was over and it was being replaced by the age of strategy. 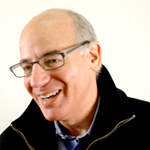 That was the model that today’s generation of senior marketers grew up knowing. It was the model that they associated with success early in their careers. And today Brand Positioning is the model that still dominates. Our research shows that the large majority of marketers are using Brand Positioning as their most common branding approach. Yet that brand positioning model no longer fits the facts and available data. The relationship between media spending and share of market has been broken. Significant brands have grown through many different kinds of branding models. Google is outspent by Yahoo, by Microsoft, by AOL. Yet Google has grown while the others have shrunk. Is the Google product really all that much better than the others at this point in time? The difference is not noticeable by the average internet user. In fact, Microsoft is putting out data to show that Bing is more relevant in search results. Big spending, a demonstrable point of difference and yet little traction in the marketplace. Strategy is not more important than Creativity. A single point of difference, repeated in all media, is like showing a 30 second commercial over and over again at the length of a feature film. The brand positioning model is broken. Media strategies have been reinvented. The models for successful branding need to be reinvented, too. A model built for a world of 3 networks no longer fits the reality of our world today. The distillation appropriate for a 30 second commercial is simply not effective in a rich media online site where people can spend as much or as little time as they desire. It doesn’t work for creating a 3 minute YouTube. The new brand models are based on the principles of storytelling. A story can be as long or as compressed as necessary. A story can be told in many episodes. A story unfolds over time. A story can have sub-plots to reach many different messages. A story has enough breathing room that it can engage in long media. The Age of Brand Positioning is over. The Age of Narrative has begun. Party like it’s 1999? Is Yahoo next? First it was MSN with the rebranding. Now it is AOL’s brand redesign. Can a new Yahoo logo be far behind? I’m having deja vu all over again. Only this time there is Google, Facebook and Skype. “Logo Schmogo” Stuart Elliott, NY Times — or why all the fuss about the new AOL logo? The quote “logo schmogo” is from a phone conversation with Stuart Elliott a couple of years ago about a rebranding program. He wanted to know about the advertising campaign. The media spend. Ad creative. Logo changes are irrelevant to his readership, he said. So he never ran an article about a logo change that actually drove business results. The ultimate irony is that Elliott has devoted a large amount of newsprint today to discuss the new AOL logo. All of the sudden the logo’s the thing. An ad campaign is just a possibility, nothing definite. So why all the fuss about the new AOL logo by Stuart Elliott? What ever happened to “logo schmogo”? Whatever AOL does or does not do, Ms. Marquess [of AOL] said, there will be gibes from critics, whom she called “the snarkies” after the snarky comments they invariably make. A couple of days ago I wrote about why this blog is not a tweet. Another 15% of accounts are not used at all. If I can count correctly, that’s 65% of existing corporate Twitter accounts are languishing. For all of the talk about Twitter, it seems that many companies are not actively engaged with it. Why they aren’t is not directly answered in the study. It could be for any number of reasons including a strategic decision, a lack of resources, a lack of understanding, no measurable ROI and so forth. It could be that many companies jumped on so many digital bandwagons in the good days past that they are wary of doing so again in today’s economic climate. This is all speculation, of course. It’s a good smart study, highly recommended for anyone who wants some facts about corporate usage of Twitter and best practices.